A quintessential German treat beloved across every region of Germany, Kartoffelpuffer are not only a favorite dish to serve at home but are also a popular street food found at local Volksfests and holiday events like Fasching, Karneval and Christmas markets. In particular these German potato pancakes bring back memories of going to my Oma and Opa’s house. Throughout my childhood and through young adulthood my Oma would regularly make these when we went over to their house. My brother and I would play cards at kitchen table with my Opa while my Oma stood over the stove with the crackling sounds and smells of frying Kartoffelpuffer filling the air. Before long, plates of hot Kartoffelpuffer were set out on the table and we helped ourselves to a sprinkle of powdered sugar and generous heaps of applesauce. My Oma knew to make big batches of these Kartoffelpuffer because my brother and I could rarely get enough of them. Depending on the region of Germany, Kartoffelpuffer are also known as Reibekuchen, Reibeplätzchen, Reiberdatschi and Grumbeerpannekuche. You may also be familiar with Swiss Rösti. But those are something different. The key difference lies in the size of the grated potatoes: Rösti are shredded whereas Kartoffelpuffer are finely grated. Also, with Rösti the potatoes are sometimes grated raw but more often are parboiled whole in their skins for a few minutes so that the center is still hard, then peeled and grated once they’ve cooled down. Because the potatoes are grated/shredded on the largest setting (in German, “grob geraspelt”) to get large, long strands, parboiling them first prevents the outside of the Rösti from burning before the potatoes are thoroughly cooked through. Grated onions are usually added and sometimes bacon and cheese, depending on the region. 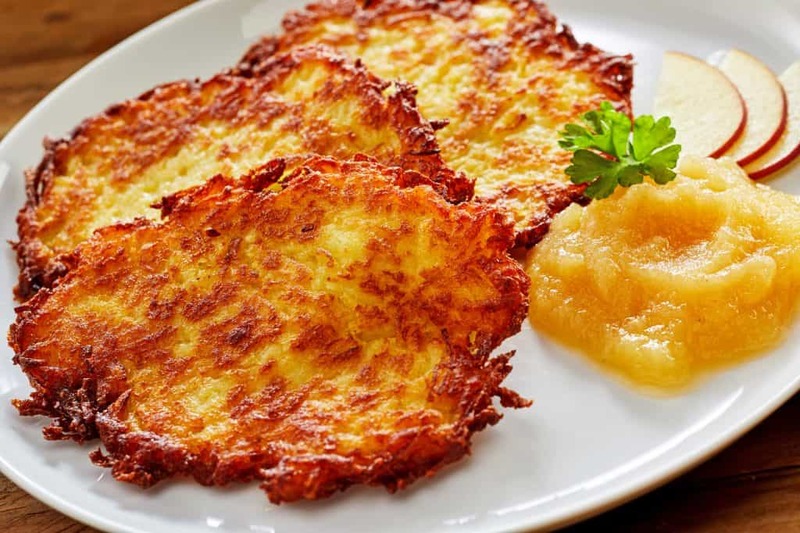 Rösti are also fried longer until they are light brown and crunchy. Kartoffelpuffer on the other hand are made from potatoes that are grated raw and grated finely (allowing them to cook quickly and evenly). The shredded potatoes are wrung out in a clean dish towel and then mixed with egg, finely grated onion and flour and then fried to light golden. The end result is a crispy exterior and soft interior. Kartoffelpuffer can be served sweet or savory. Most commonly they’re served with apple sauce or other fruit compote, and/or dusted with powdered sugar, but are also served savory-style with a yogurt-herb sauce or with meat as part of a meal. In a word, they’re simply DELICIOUS! Use a grater or food processor to finely grate the potatoes. You don’t want thick strands. Either place the grated potatoes in a colander and thoroughly squeeze the liquid out with your hands or place them in a clean dish towel and wring it to squeeze out the liquid. 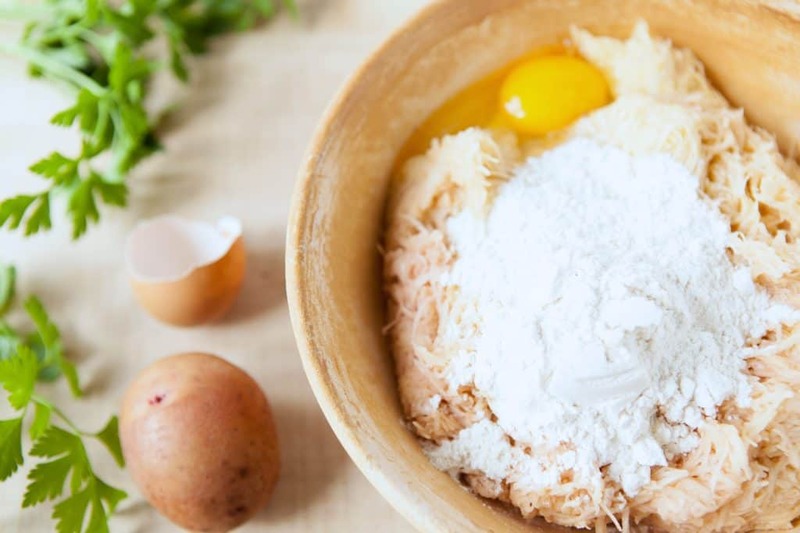 Place the drained grated potatoes in a bowl along with the grated onion, eggs, flour and salt. Use your hands to knead the mixture together until you have a thick, tacky mass. Don’t let this mixture sit for long before frying it. Heat some oil in a non-stick pan over medium-high heat. Once hot, add 1/3-1/2 cup (depending on size preference) of the potato mixture to the frying pan and flatten it with the back of a spoon to form pancakes. Fry the Kartoffelpuffer on both sides (about 3-5 minutes) until golden brown. Place the fried potato pancakes on paper towels to briefly blot them and then immediately serve them while hot. Serve with applesauce, fruit compote, or powdered sugar or serve it savory-style with some herbed yogurt, quark or creme fraiche or with meat and gravy. Called by different names in Germany's various regions, Kartoffelpuffer are a quintessential and favorite German treat. Easy to make, these potato pancakes taste incredible! Thoroughly wring out the liquid in the grated potatoes by placing them in a colander and squeezing them with your hands or by placing them in a clean dish towel and wringing out the liquid. Place the drained grated potatoes in a medium-sized bowl with the grated onion, eggs, flour and salt and use your hands to work it into a tacky mixture. Add a little more flour if needed. Do no let the mixture sit for long before using it, use it immediately. Heat a few tablespoons of oil in a non-stick pan over medium-high heat and place 1/3 to 1/2 cup of the mixture (depending on size preference) in the hot pan and flatten into pancakes with the back of a spoon. Fry on both sides for 3-5 minutes until the Kartoffelpuffer are golden. Place them briefly on paper towels. Serve immediately while hot with applesauce, fruit compote or powdered sugar. For a savory version serve with herbed yogurt, quark or creme fraiche or with meat and gravy as part of a meal. My grandmother used to make these all the time! I had forgotten how much I love them! I have never had these and I definitely need to try them. Amazing! 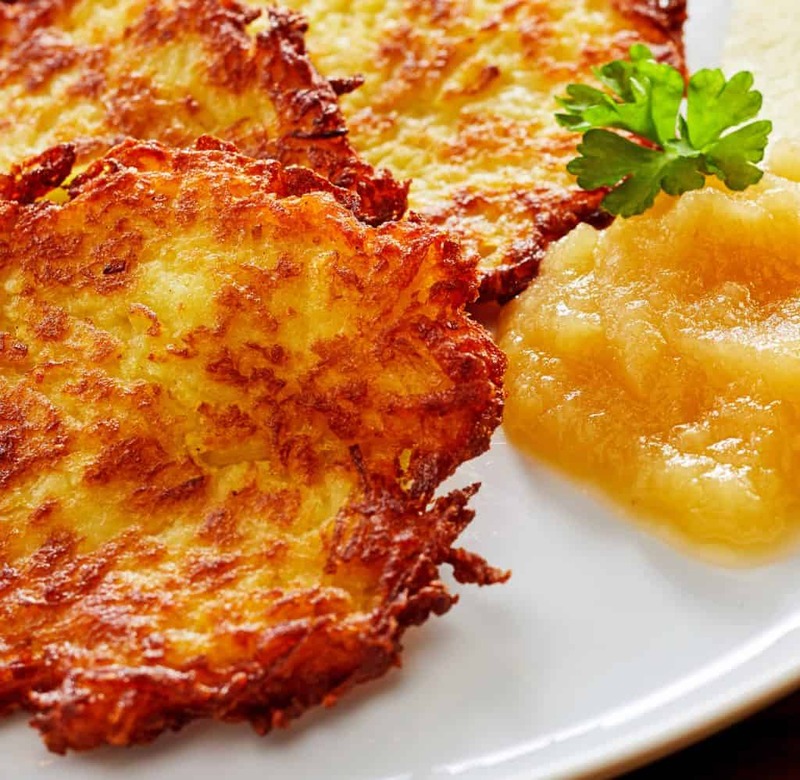 I love a great potato pancake, so I’m definitely trying these out! I whipped these up for a light dinner (staple ingredients I always have on hand) and boy were they delicious! I haven’t had these in YEARS and I’m so glad you reminded me of what I was missing. Fantastic, Natalie, thanks so much! Can’t wait to try them later, will let you know how I get on. Awesome!!! My German Oma added some marjarpm for the savory ones!! Those look really wonderful! Potato pancakes are always a holiday favorite around here! Haven’t had these in forever. They bring back such great memories! This will be perfect when my family comes! This is right up their alley! These remind me of Potato Latkes – so similar and so delish!! I have wanted to do this for ever. I must make sure I do sometime soon. Awesome recipe! 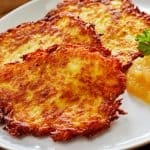 Love good potato pancakes, and my Polish Grandmother made them all the time, and they go with anything and everything. Will get around to making them, of course I am by myself with my “SERVICE DOGGIES” they will love them too for a little treat.. They eat what I cook, no dog food!!! My Polish Grandmother (From Wilkes Barre, PA)used to make these 2 or 3 times a month…. The only difference I see is that she would add an onion to the grated potatoes…. I did prefer the potatoes shredded rather than grated…. I love food that brings back memories of family! This is a great recipe and can’t wait to try it! 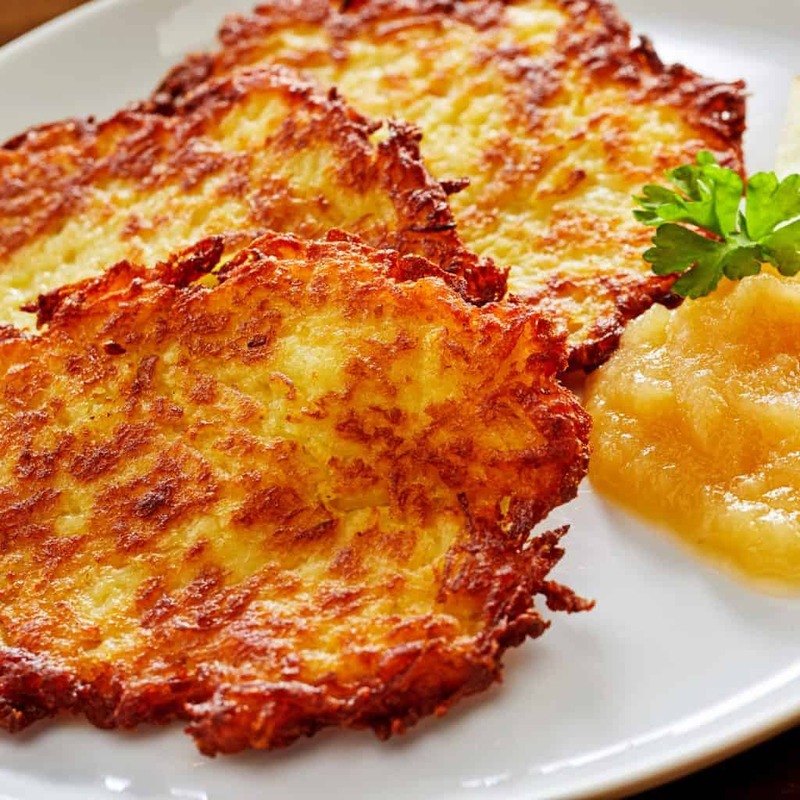 Being from Pennsylvania, I grew up on potato pancakes, but I never tried them grated. This seems like something I would love and will try very soon. My hubby and I love breakfast anytime of the day and this will fit right in there soon. Thanks!! I cook for myself, but the left over pancakes make a great wrap for egg salad! I’ll bet, J., Kartoffelpuffer are wonderful both sweet and savory! Awesome, I’m glad you’ve discovered the missing ingredient, Bob. I love the sound of that beetroot and parsnip rostie! These are the same as potato latkes that are served this time of year at Hanukah. I love them! My husband loves them with apple sauce and I love them with sour cream. They are great as a side or a main dish with a salad. They sure are, BC, I love them every which way! Am I correct to assume RAW Potatoes? Hi Jaye, YES, the potatoes are raw. I had forgotten about these, too. (How could I do that!). My Mamma used to make these all the time and it was my dad’s job to grate the potatoes…..then it was my job when I got older. Yep, had to have grated onion, too. (I remember the scraped knuckles, lol). Now I have a husband who is willing to grate potatoes. He had a German Mamma, too. I will make these tomorrow. This brought back many great memories for me, thanks for this delicious recipe. My family made these and we had either with applesauce or sour cream. I think maybe chives went into the mix, maybe! For a savory version, chives are a great addition, Adrienne! You are absolutely right, these are not rösti. But the difference is not what you say it is. I make my rösti with raw potatoes and grate them just as finely/coarsely as I do my potato pancakes. The difference is that rösti is just potatoes, potato pancakes are a “batter” – there’s eggs and flour/potato starch added. My mom always added fresh parsley. I make them using Russet potatoes because they are not too watery. seconds at a time. Less work still taste great. These were the best potato pancakes i have ever made and family agrees. So much better than my other fail cakes! so good. I added a little garlic chive and shallot. yum! I’m so thrilled to hear that, Amy, thanks for the feedback! Hi Mike, The sauce might have been leftover sauerbraten gravy. We always had extra and had it on the potato pancakes the next day. If you don’t want to make the sauerbraten you could probably make a beef gravy and add some red wine vinegar and sweetner to give it that sweet and sour taste. I personally like the ginger snap cookies in the gravy. It gives it sweetness and a bit of kick from the ginger. That is the flavor profile I grew up with. Boy, did this bring back memories. Hi David, thank you for sharing all of these wonderful memories. I hope you enjoy the Kartoffelpuffer! My German grandmother’s “secret ingredient” was to add a grated apple to the mix. Yummy. And she would never used mashed potatoes!!!! These were a regular dish on “meatless Fridays” in our Catholic household. Even my Dad would make them occasionally. Decades later, visiting my brother, the one dish he always wanted me to make were these pancakes. Fantastic, Liz, I’m so glad you enjoyed them – thank you! Since it’s Octoberfest time, I made these the other night with some brats and rotkraut (from a jar). My Dad and I were the ones in the family who really liked the potato pancakes and he made great ones. I was being a little lazy, and so use the grater disc on the food processor for the potatoes. They did turn out great, but might have been better if I’d more finely grated them. Next time, I’ll sacrifice my knuckles on the hand grater, or maybe get a new finer grating disc for the F.P. All in all they were a success. Family loved them. Thanks for posting this recipe. It’s a keeper! Fantastic, Georgette, I’m so glad and appreciate the feedback, thank you! My Opa would make these but instead of applesauce he would put fresh blueberry sauce on top. Delicious! You also can serve them with smoked salmon and sour creme with dill as starter in a menue. Hi, these look awesome, can’t wait to make them! Question: do you know if these can be made ahead, cooked, and frozen…and then reheated? Of course there is nothing like freshly made/served immediately, but I would love to make these for Christmas Eve and it’s going to be tough frying these up when guests have already arrived! So I’m wondering if you (or anyone else) have made these ahead of time? If it can be done, that would be amazing! Thank you so much for sharing this wonderful recipe!! Hi Liz, I haven’t tried that but I don’t see why it wouldn’t work. I would just recommend reheating them in a frying pan in order to get some of the crispiness back. Since you’re serving them for an important occasion I’d also recommend giving them a trial run in advance – freezing, thawing and reheating them in the pan to see how they turn out. Please let us know the results! Your recipe calls for a “non-stick” pan. Will a properly seasoned cast iron skillet work as well? Hi Tim, as long as the pancakes don’t stick to it, absolutely. OK, so these look good enough to try, but I’d love a your recipe for Kartoffelklose. I tried making those wonderful, fabulous, delicious things once, and they turned out OK, but I bet yours would be much better. Btw, I’m not German, and have no access to either German cooks or food unless I go to Germany, but I love the stuff. My rotkohl is to die for and the recipe is nearly the same as yours, but I never thought of using cherry jelly, which makes my mouth water.